We are very happy to welcome you to SriVidya Guru Sri Vimarshanandanathendra Sarawathi Swamigal Aradhana at His Holy Adhishtanam in Chennai and Navaratri Mahotsavam at different locations. Disciples of the Ashram across the globe are getting together to celebrate the auspicious Navaratri. 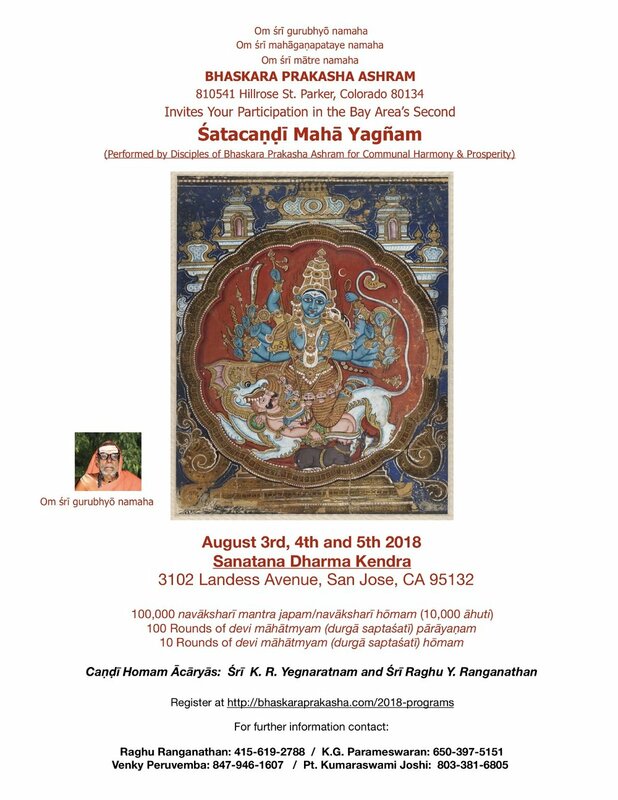 We welcome you all to join us for the Shata Chandi Maha Yagnam at San Jose this weekend. The highlights of this year's Shata Chandi Homam includes the Lalitha Sahasranama & Mahayaga Krama Puja on a specially hand drawn Sri Chakram. A musical Naradeeya Keertan in the tradition of Sant Gnanadeva along with Purusha Suktam and Sri Suktam combined with Panchadashi Mantra will be offered to Lord Vittala and Goddess Rukmaayi. Sri Matre Namaha!! Sri Gurubhyo Namaha!! The much anticipated Chicagoland Shatha Chandi Mahayagnam that was conducted over a three day period by disciples of Bhaskara Prakasha Ashram from Friday, June 29th to Sunday, July 1st was a bliss-filled experience for all of us. The rare presence of Sri Gnanananda Teertha Swamigal and Sri Yegnarathnam mama was a delight for all devotees, and so were the loving presence of our gurus Smt. Akhila manni and Sri Raghu anna. On Friday, the evening’s program started off with a soulful performance of Sri. Muthuswami Dikshitar’s navavarna krithis by the local artists. Their beautiful renditions created the perfect ambiance for the Sri Lalitha Sahasranama Kumkuma Laksharchana by 108 Suvasinis. 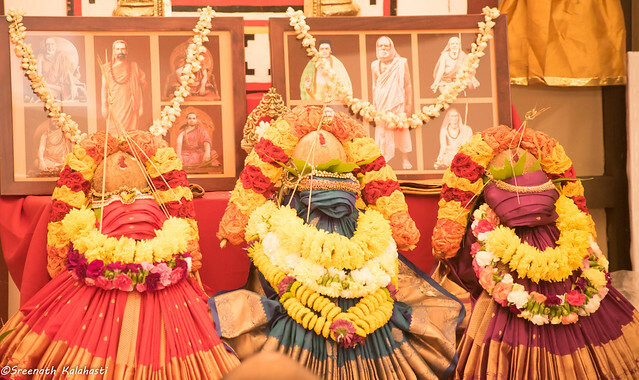 The highly sacred Navavarna poojai by Sri Swamigal on all the days was an added treat to all who thronged the place. On Saturday morning, the day’s program started off with the recitation of the Vedas, Upanishads and Rudrabishekam , and these were followed by one round of the Devi Mahatmiyam parayanam. While this was going on, the Navavarna poojai was conducted by Sri Swamigal . The highlight of the event- the 108 Suvasini Poojai - was a rare sight to behold. Each Suvasini was ascribed a naamaah from the Devi Vaibhava Ascharya Ashtothra Shatha Namavali and, she was treated as a Goddess Herself with the upachara poojas being offered after Avaahanam. Everyone who attended this poojai was moved and felt the palpable presence of the Goddess Herself. This was followed by the highly auspicious and rare Thithi Nithya poojai celebrating the Goddess within each Suvasini. The concluding prayers for that session were Sri Lalitha Sahasranamam, Sri Vaibhava Ashcharya Ashtottha Stotram and The Sri Lalitha Trishathi Stotra parayanam. The evening program began with the well-known Abhirami Andadi and Abhirami Pathigams in praise of Ambal by Abhirami Bhattar, a true devotee of Ambal. Yegnarathnam mama gave us a bhakthi filled and highly moving speech on the karuna aspect of the Devi and the proper method of worshipping Her as it is laid down in Sri Tripura Sthavaraja. Sunday morning was replete with all the special homams that one could imagine. Since it was Sankatahara Chaturthi, special prayers were offered to Lord Ganapathy with the Chathuravartti Tarpanam by Sri. Sridhar Sivaraman mama. 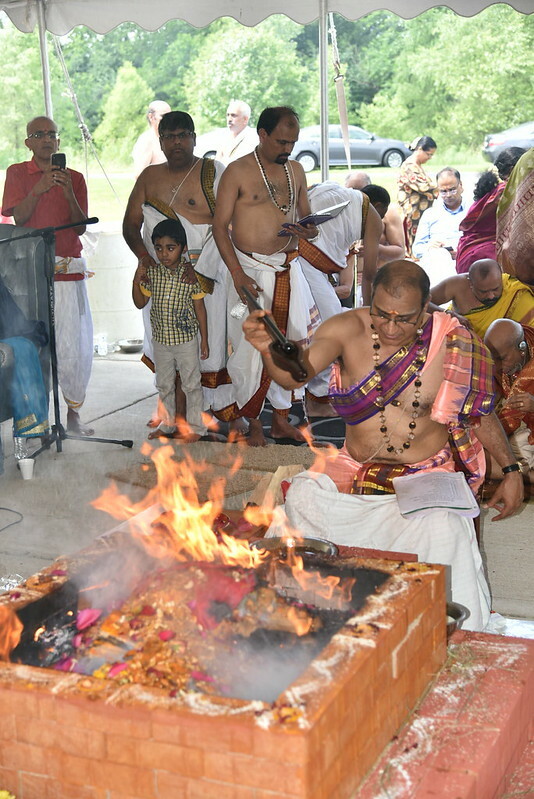 After a recitation of the Upanishads, Ganapathy Homam, Rasi Graha Nakshatara Yogini Homam, Rudra homam , Sundari Garbhita Purusha and Sri Suktha homam, , Navakshari Moola Mantra homam, Chandi homam, and the Sri Vidya Navavarana homam were conducted by our gurus in strict accordance with the procedures and rules laid down in the shastras. While these homams were taking place, the Navavarna poojai was being performed by Sri Swamigal to the Kalashas and the Sri Chakram. Simultaneously, the Kanya poojai(11 of them) and Vatuka Poojai (10 of them) and Sumangali Poojai were offered. The Dampathi poojais were offered to our Gurus as we sought their blessings. The concluding prayers and mantras of the Chandi Homam were a sight to behold. At the volunteer appreciation meet, Sri Yegnarathnam mama’s parting words of advice inspired us all, and the most stunning aspect was that his speech was followed immediately by a rejuvenating shower of rain. Mama later told us that The Devi was extremely happy with the effort of Her children and this was Her way of manifesting it. We were thrilled and humbled. On the concluding day, all of us, devotee-volunteers felt that we were a part of a huge family all with the focused purpose of Loka kalyanam. What better way of spending a weekend than celebrating the glory of Shri Mahashodashi!! May we all come together again very soon for lokakshema !! Loka Samastha Sukhino Bhavanthu! The Chicago ShathaChandi Yagnam starting this weekend with Sri Lalitha Sahasranamam Laksharchanai on Friday the 29th of June 2018 (tomorrow) and ending with Sri Chandi Yagnam on Sunday the 1st of July has been off to an incredibly auspicious start with the beautiful Pournami poojai and Navavarna poojai yesterday by Sri Gnanananda Teertha Swamigal and Sri Yegnarathnam mama. A highlight within the highlight was Sri Yagnarathnam mama’s explanation on the importance of chanting Sri Lalitha Sahasranama. 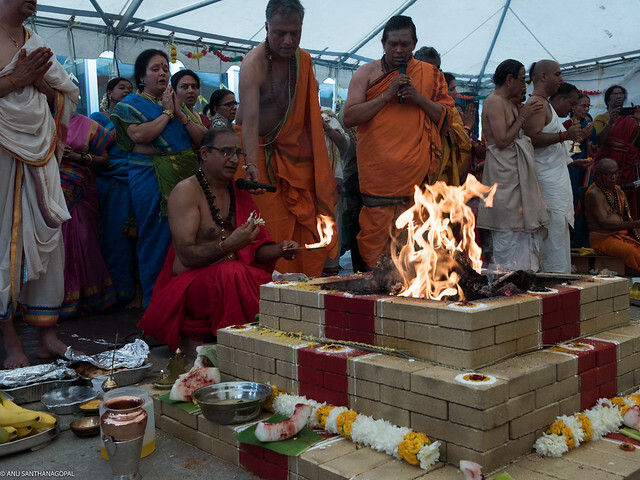 The past few months of getting ready for a yagna of this magnitude- the first of its kind in the Chicagoland area- has brought together scores of devotees many of who are volunteers in a united and common purpose of serving the conduct of this yagna. We had weekly Devi Mahathmyam Paarayanams and one special Navavarana puja and Devi Mahatmyam Paarayanam on the Mother's Day on May 13, 2018 performed by our Gurus Sri & Smt Raghu Ranganathan with a Maha Sankalpam for the Shata Chandi Homam. With the blessings of our Guru Parampara and Sri Mahashodashi, we have come to realize that our miniscule role in this cause is probably the result of the yearnings of several janmas. The presence of our gurus and their loving support and guidance have filled us with endless faith, joy, and enthusiasm that the LokaKshema for which this Yagna is intended will be blessed by Ambal. Please see the details of program here. Individual Sankalpams for the Shata Chandi Yagnam will be done during the event. Simultaneously Upanishads Parayanam, Rudrabhishekam, Guru Paada Puja, Devi Khadgamala & Lalitha Trisathi Archana, Tripura Stavarajam, Ascharya Ashtottaram and Lalitha Sahasranamam will be recited. We invite ALL devotees to participate in the Devi Khadgamala and Trisathi Archana. A Sri Chakra blessed by Sri Swamigal will be given to every participant (one per family) to perform the Archana. Other Pooja Items will be provided at the venue. At the end of the Pooja, devotees can take the Sri Chakra as Prasadam. With the blessings of Guru and Chandika Mahalakshmi, disciples of Bhaskara Prakasha Ashram, Toronto will get together to perform Shata Chandi Maha Yagnam in the presence of Sri Gnanananda Teertha Swamigal. Sri Swamigal will perform Sri Chakra Navavarana Puja and Chandi Aavarana Puja during the Homam. Please see flyer for detailed program schedule and register here as early as early as possible to book your spot for performing the Archana to Sri Chakra on June 09. We invite all devotees to participate in the divine events to seek Sri Swamigal's blessings and Devi's Anugraha. We are pleased to announce that Sri Gnanananda Teertha Swamigal of Bhaskara Prakasha Ashram will be with us to bless us during the two day Pujas and Homams in Mississauga and Brampton on June 9 & 10. Please see details below. Sri Gnanananda Teertha Swamigal was born as the illustrious second son and also a very competent disciple of rare talent of our Guru Sri Vimarshananda Nathendra Saraswati Maha Swamigal. Having born in the family with rich heritage of Vedic scholarship & Sri Vidya Upasana, Sri Gnanananda Teertha Swamigal (in his Poorvashrama called fondly as Sundara Chittappa) followed the prescribed ordainments and was initiated into the Srividya upasana by his Poorvashrama grand father and Guru Sri Prakashananda Natha. Later, under the tutelage of his Poorvashrama father he learnt the nuances of Sri Devi Puja. To put it in a nutshell, he is a practicing Sri Vidyopasaka par excellence and no field or practices in the Great Ocean of Sri Vidya worship is untouched or unvisited by him. As a Sri Vidya Upasaka he attained the consummate status and got devout disciples. By the will of Sri Parameshwara and by steadfastly following the path laid by the forefathers, he vowed to transcend into the Fourth Phase of Sanyasam on January 1st, 2017. It is indeed a great blessing for all of us that he consented to travel to North America to perform Sri Vidya Navavarana pujas this year. Devotees will be performing the archana to Sri Yantras with Sri Devi Khadgamala and Lalita Trisati in his presence and we encourage every devotee to register here as early as possible to reserve your seats. The Devi Khadgamala is a very important Mantra for a Srividya Upasaka. The origins of this Vidya may be traced to Puranas and Tantras. The Khadgamala mantras are regularly chanted by those who are duly initiated into Srividya and those who perform Nitya Japa of Devi. It is said that mere recitation of Khadgamala confers not only the Pooja Phala of complete Navavarana worship, but also of every other form of worship. With the blessings of Goddess Chandika Mahalakshmi and our Guru Parampara, disciples of Bhaskara Prakasha Ashram will be conducting a Shata Chandi Maha Yagnam in the divine presence of Sri Gnanananda Teertha Swamigal. 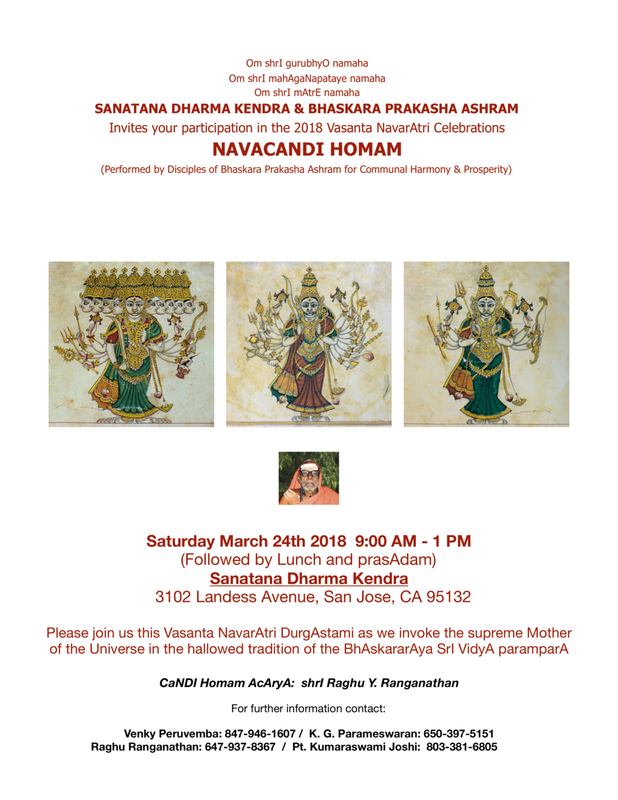 Sanatana Dharma Kendra and Bhaskara Prakasha Ashram invite you to participate and receive Devi’s blessings for the Maha Yaga Krama and Nava Chandi Homam on the auspicious occasion of Vasantha Navaratri this Friday, Mar 23rd and Saturday, Mar 24th at Sanatana Dharma Kendra, 3102 Landess Ave, San Jose, CA - 95132. 9 PM. Mangala Harathi and Maha Prasadam. All devotees can perform archana to the large Srichakra mandala specially drawn for this puja. Please join us for the Sri Chandi Maha Yagna at Bhuvaneshwari Amman Temple, 230 Wilkinson Road, Brampton, ON- L6T 4N7 on the occasion of Vasanta Navaratri and Ugadi celebrations on Sunday March 18, 2018 performed by Bhaskara Prakasha Ashram, Canada. 2018 Bhaskara Prakasha Ashram Programs - Registration open now! We are happy to share our Ashram's 2018 programs in Canada and USA with you. Please register here for all events you are interested in participating as a Ritwik, volunteer or devotee. You can register for multiple events in the same form. We will provide event and location details to registrants closer to the event date. Many of you have been learning Durga Sapthasathi also known as Devi Mahatmyam from Bhaskara Prakasha Ashram YouTube videos. Due to the overwhelming response to the online classes and requests from devotees to record the complete Durga Sapthasathi with Puja Krama (procedures), we are pleased to release the complete chanting of Durga Sapthasathi Puja Krama chanted by Raghu Y Ranganathan and Akhila Ranganathan. We sincerely hope that this recording, where the chanting is done in slow pace will be helpful for devotees to perform the Durga Sapthasathi Paarayanam. We are very happy to welcome you to 2017 Navaratri Mahotsavam and Shatabhishekam celebration in Chennai, India. Please click here for the invitation and program details. For this Navaratri, Bhaskara Prakasha Ashram devotees around the world will be performing Lalitha Sahasranama Laksharchana using the audio recording of Sri Vimarshananda Nathendra Saraswathi Swamigal recorded in 1975 by Late Shri N.M. Venkatraman. Thanks to Sudha and Saikumar of Atlanta, GA, this recording was preserved and provided to us when we visited Atlanta in 1998. As this was a live recording, the two missing Namas were recorded again with the voice of R.K. Sriramkumar and Smt. Akhila Ranganathan. This is a unique recording where each Nama is chanted either by Sri Vimarshananda Natha or by his Poorvashrama brother Sri K.S. Kameshwaran and the same namas are repeated by devotees. I was fortunate to be part of this chanting and the lead male devotee voice is my father Sri K.R. Yegnarathnam. We are immensely happy to release this audio recording on the occasion of Sathabhishekam of Sri K.R. Yegnarathnam. It can be downloaded from the Publications page. We are looking forward to your participation in the Navaratri Celebrations this year. We would like to share some photos of the Shata Chandi Maha Yagna performed by Bhaskara Prakasha Ashram in San Jose, California. The photos here were taken by Sreenath Kalahasti of Kalahasti Photography. He has captured the immense devotion and divinity present at the event through his beautiful photography. An event of this magnitude requires incredible amounts of planning and preparation. The organizers and volunteers did a phenomenal job taking care of every detail. On behalf of Bhaskara Prakasha Ashram and all the devotees who participated in this Yagna, I would like to extend our heartfelt gratitude to this team. You can view the full set of photos here. With the Grace of our Guru and Goddess Chandika Mahalakshmi, the Shata Chandi Yagna conducted at Ved Mandir in New Jersey was a divine experience for all of us who participated. The entire community came together and volunteered to ensure every detail in every aspect of this massive event was meticulously taken care of. On behalf of all devotees who participated in this function, I want to express my heartfelt gratitude to our New Jersey BPA members for making this event possible. 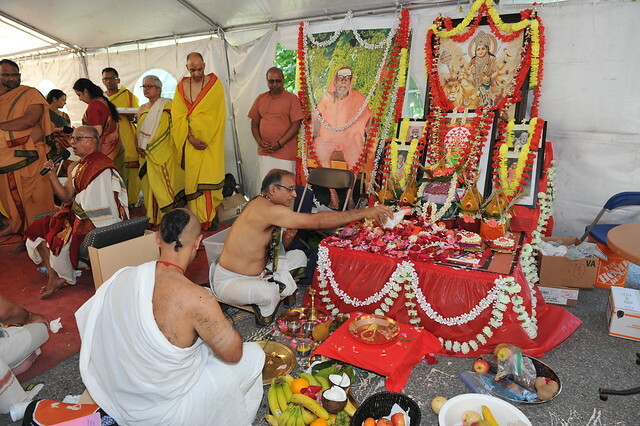 We would like to share these photos from the Shata Chandi Yagna in New Jersey. Please join us at Sanatana Dharma Kendra in San Jose for three days of divine prayers to Goddess Chandika Mahalakshmi. Program details are below. We would like to express our gratitude to all those who have contributed in one way or the other to make this annual event of Bhaskara Prakasha Ashram in Canada a great success. We were blessed to perform this Trishati Suvasini Puja on the auspicious day of Guru Poornima. Our Guru Sri Vimarshananda Nathendra Saraswathi Swamigal, who was sakshat Devi swaroopam, and our father and Guru Sri K.R. Yegnarathnam have been the driving force to enable us to organize such pujas and homams at this scale. The BPA family has worked extremely hard, both in the foreground and background. From purchasing homa drayams to typing up the texts and taking care of every small detail of this event, they were with us at every step. The entire community's devotion to Devi, interest and hard work has once again culminated in another divine event. Every person in our community extended their support to us wherever we went and we are immensely grateful to the divine to have you in our life. From the bottom of our hearts, we would like to say thank you to each one of you. Earlier this year, an ornament with Lalitha Trisathi's 300 naamas inscribed on each Gold coin was offered to Kanchi Kamakshi on the occasion of Kumbhabhishekam. A few members of BPA came together and contributed 9 Gold coins for this holy cause. This inspired us to perform a Trisati Suvasini puja in Toronto. We are very thankful to all Suvasinis for accepting our invitation to be a Suvasini and help us achieve our Sankalpa. Organizing this puja involved tremendous hard work by so many people and it is not only due to Guru's grace but with all your support and cooperation that we were able to accomplish this. May our Guru Parampara continue to bless us! Here are some photos from this event to help us relive those divine moments. Click here for the full set of photos. Thank you for the overwhelming response we have received for the 2017 USA and Canada events. If you have not yet registered, please click here to register. For the first time in North America, Bhaskara Prakasha Ashram is planning to perform Trisati Suvasini Puja, where each of the 300 sacred names of Goddess mentioned in Lalitha Trishati will be invoked in 300 Suvasinis (married women). Reciting Lalitha Trishati immediately pleases the Goddess and invoking these names in Suvasinis is considered auspicious for the Suvasinis as well as the entire community. With the grace of Guru and Devi, we have reached the target of 300 Suvasinis. Suvasini registrations are closed now. You an still attend and participate in the Puja and Homam events. Click here for Trisati Suvasini Puja event details. The Shata Chandi Maha Yagna consists of 100,000 Navakshari Japam, 10,000 Navakshari Homam, 100 Devi Mahatmyam Parayanam and 10 Devi Mahatmyam Homam. Click here for New Jersey Shata Chandi Yagna event details. Sponsorship of pujas and homams is available for all including those registered as Suvasinis. We are looking forward to your participation in these events. Sri Gurubhyo Namaha. 2017 Programs by Bhaskara Prakasha Ashram - Save the Date! We are happy to share our Ashram's 2017 Programs in USA/Canada with you. Please register here for all events you are interested in participating in as a Ritwik or Volunteer. Please click here to view the photos from the Sanyasa Ashrama Sweekaram ceremony. Thanks to Sri R. Subramanian and Sri K.S. Lakshmanan for the photography. The Ashrama Sweekaram function was performed in the traditional Vaideeka style. Prior to the Sanyasa Sweekaram, Ashta Sraddham and Viraja Homam were performed. There are prescribed disciplines to be followed when a person changes from Grahastha Ashram to Sanyasa Ashrama. Also, our shastras prescribe the daily anushtanam (duties) for a sanyasi. It is noteworthy that the duties and obligations for a sanyasi and the methods required for Krama Sanyasa (Sanyasa sweekara taken by a grahastha as prescribed in our vedas and dharma shastras) were published in 1959 from ancient manuscripts by our parama guru Sri Prakashananda Nathendra Saraswathi. We would also like to share with you a Tamil translation of the Sanyasa Shlokas by Sri K Kalyanaraman Iyer. Sri Kalyanaraman is a great friend of our families. He belongs to our Siddhamalli Parampara and he is the son and disciple of Sri Vidya Guru Kalyana Sundaram Iyer of Madurai. Sri Sundaram Dikshithar (Sundara Chithappa as he is affectionately called by all of our family members) is taking Sanyasa Ashram on 1st January, 2017 on the banks of river Thamrabarani in Suttha Malli Village, Tamil Nadu. Suttha Malli is the birthplace of our Moola Guru Sri Kameshwarananda Naatha, wherein he built the famous Lalithambika Mutt and installed Sri Lalithambika Vigraha in the Mutt temple. Sri Sundaram is the illustrious second son and also a very competent disciple of rare talent of our Guru Maharaj Sri Vimarshanandendra Saraswati Maha Swamigal. To put it in a nutshell, he is a practicing Sri Vidyopasaka par excellence and no field or practices in the Great Ocean of Sri Vidya worship is untouched or unvisited by him. In Vedic Dharma, there are four stages of life (Ashrama) namely Brahmacharya, Grahastha, Vanaprastha and Sanyasa. Of these, the Sanyasa Ashrama, also called Turiyashrama, is the highest Ashrama and is considered to be Sacred and Divine. Traditions and Shastras insist that when you reach the ripe age of 70 after fulfilling your religious and social obligations as ordained in our Scriptures, you enter the last stage called Sanyasa Ashrama, and leave the mortal remains of the physical body in this earth as a Sanyasi at the time of death. Once you enter Sanyaasa Ashrama, you don’t need to perform religious rites as ordained for a householder; because of this, you have to perform the Ashta Shraddha and Viraja homam before taking Sanyasa in order to fulfill the last ritual obligations to your forefathers and obtain final release from any more obligations in future. This Ashrama is most suited for your Spiritual journey upward in whatever discipline you are interested. In our Guru Parampara, all of our Illustrious Gurus starting from Sri Kameshwarananda Natha to our Guru Maharaj Shree Vimarshananda Natha took Sanyasa at a later stage after an event filled Grahastashrama where they performed all sacrificial rites as ordained in the Vedas. In fact, Sri Vidya worship as any other tantra worship is non sectarian and is open to all irrespective of caste, gender and religion and place. It does not know any geographical boundaries. This worship is permitted to be practiced by all four Ashramins - Brahmacharya, Grahastha, Vanaprastha and Sanyasa. It is a hallmark of our great Guru Parampara that there is absolutely neither a conflict nor a contradiction between the Vedic practices and tantric mode of worship. Reconciliation of alleged conflict of Shastras and apparent contradictions require the applicability issue such as the competency and temperament to be clearly defined. They have taken to Sanyasa Ashrama even though they know that this is neither necessary nor is it recommended for a Sri Vidya Upasaka. However, they find it really useful for themselves as well as their wards and disciples because there is no such thing as a 10 day mourning period for Sanyasis. It is like a festival and Utsava to be celebrated and enjoyed. Veda permits Sanyasis to practice Sri Vidya Worship. This Sanyasa Ashrama is most suitable for attaining highest level of Atma Gyana through constant Self Inquiry as enunciated in the transcendental form of Sri Vidya Upasti (Bhavana) by inner Consciousness. Sri Sundaram Dikshithar's Sanyasa Ashrama Sweekaram is a divine moment and we seek his blessings for all those present physically and mentally. In addition to the Sanyasa Ashrama Sweekaram, we will be performing a Trishati Suvasini Puja to seek Devi's blessings on this auspicious occasion. With the blessings of our Guru and Maha Shodashi, we were all blessed to complete this year Shata Chandi homam in Toronto, Canada and Chandi homam and Sri Vidya homam in Houston, Dallas, Denver, Princeton, Brantford and Phoenix during the months of April 2016 to September 2016. Please click here to view some of the pictures from this year's events. Starting this week, we are celebrating the Aradhana of our Guru Sri Vimarshananda Nathendra Saraswathi Swamigal and Sharada Navaratra Utsavam. Special events have been planned in the Chennai and Toronto Ashrams. Please click here to view the program details. Due to the overwhelming encouragement and support of devotees, we have started various online classses via Bhaskara Prakasha Ashram Youtube channel. These videos can be accessed by all devotees interested in learning Vedas, Lalitha Sahasra Nama, Lalitha Trisathi and many other Upanishads and Shlokas. Please subscribe to the Youtube channel here to receive regular updates and notifications for new videos. We thank you for your endless support and encouragement in pursuit of Devi Upasana and pray to our Guru and Maha Shodashi Devi to bless all of us.